When the chin is undersized, it affects the balance of the face by changing facial proportions. 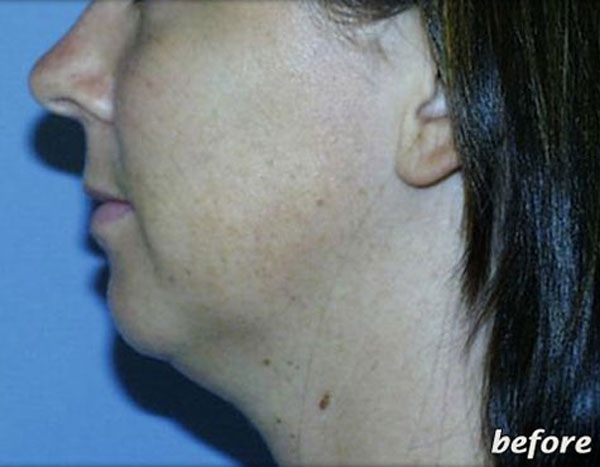 The nose appears larger and more noticeable, a double chin appears because of a short jawline and a diminished chin gives the appearance of weakness. The best way to find out if chin augmentation is right for you is to schedule a consultation with Dr. Matas. After a thorough evaluation he can tell you if you are indeed a good candidate for the procedure and suggest the type of chin implant that can accomplish your goals. It is common for patients who are seeking other facial rejuvenation procedures to combine a chin augmentation for enhanced results. For patients who are not good candidates for surgical placement of a chin implant, Dr. Matas may recommend non-surgical dermal filler injections, like JUVÉDERM®, to accomplish cosmetic improvement of the chin. Dr. James Matas, a board-certified plastic surgeon in Orlando, Florida, has extensive experience performing chin augmentation. At your initial consultation, he will discuss your goals and motivations for surgery, along with assessing your physical and emotional health and reviewing information you provide about previous surgeries, past and current medical conditions, as well as nutritional supplements, herbal remedies and pharmaceutical medications you take. He will examine the structures of your face and thickness of your skin, as well as the relationship between the size and shape of your chin compared to your other facial features. He will recommend the exact procedure, or procedures, needed to bring about the desired result, outlining the techniques and incisions needed, the type of anesthesia, where the surgery will be performed and the risks and possibility of complications. He will advise you to avoid taking aspirin, ibuprofen products, Vitamin E and certain herbal medications before surgery, as these can cause increased bleeding or have undesirable effects with anesthesia. Furthermore, he may recommend additional procedures be done at the same time in order to further balance facial features, such as fat removal under the chin or rhinoplasty to resize the nose. 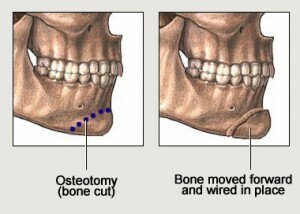 A small incision is placed beneath the chin and a pocket is created just above the jawbone where the implant will be positioned. A pre-measured chin implant is then placed in this pocket where it stays firmly in place. Sometimes, sutures are used to further anchor the implant. The incisions are closed with several layers of sutures and a butterfly is used on the skin’s surface, so there are no visible sutures. The procedure is performed outpatient and takes approximately one hour unless additional procedures are performed. You will be discharged wearing a garment under your chin for support, and you will be asked to wear this for a few days. You may have a small amount of soreness, bruising and swelling, but this resolves quickly. You can get back to work within a few days, but should avoid vigorous physical activity and contact sports for a few weeks. If you are considering chin enhancement surgery and would like to review chin augmentation before and after photos featuring our patients, we invite you to visit our digital gallery. During your consultation, Dr. Matas can show you more examples of his work to demonstrate the kinds of results that may be possible for you. 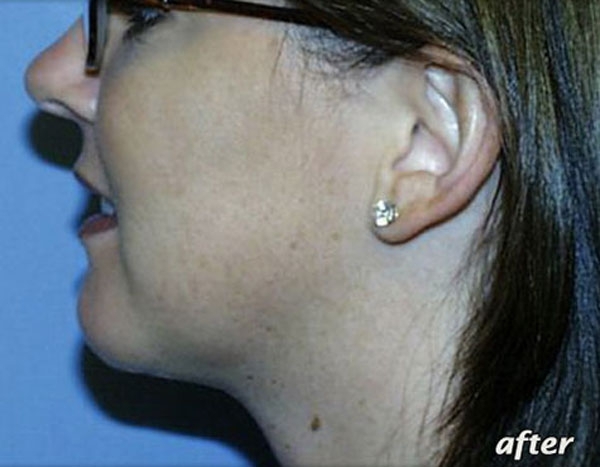 Patients who undergo chin augmentation with Dr. Matas are typically very satisfied with their results. Because the procedure is fully customized to suit the unique facial features and goals of each patient, he is able to achieve results that look-natural and aesthetically pleasing. What type of chin implant is right for me? While chin implants can be made using a variety of materials, the majority of implants are constructed of biocompatible silicone rubber. There is also a wide range of chin implant sizes, shapes, lengths, and projections to choose from. Dr. Matas has extensive experience performing chin augmentation procedures and selects chin implants that are well-suited for each patient’s unique facial structure. The goal is always to achieve harmony among the facial features for improvement in aesthetic appeal. Should I combine my rhinoplasty with chin augmentation surgery? For some patients who desire to change the size or shape of their nose, Dr. Matas may recommend combining rhinoplasty with chin augmentation. In these cases, creating a stronger chin can balance the nose for more aesthetically pleasing facial proportions. During a one-on-one consultation, you and Dr. Matas can discuss your concerns and develop a custom surgical plan designed to achieve your cosmetic goals. How long will my chin implant last? Chin implants are created to last long into the future and rarely require replacement during one’s lifetime. If you desire a different look down the road, your chin implant can be removed and replaced with one that suits your new cosmetic goals. Does chin augmentation create scarring? Dr. Matas uses a chin augmentation technique that utilizes a small incision beneath the chin to place the implant. While the incision will leave some scar tissue, it typically remains well-hidden under the chin. Will people know that I have had a chin augmentation? As with all plastic surgery procedures and cosmetic treatments he performs, Dr. Matas strives to create subtle, natural-looking results with chin augmentation surgery. 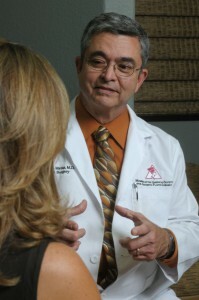 His philosophy is to help you look and feel your very best, without making it obvious that you have undergone surgery. If you are concerned about the way your results may turn out, we encourage you to look through before-and-after photos featuring our chin augmentation patients to see what their outcomes look like. Many of our patients report that they receive more compliments on their appearance from friends and coworkers, but it is very rare that anyone discovers the reason behind their new look. Can a chin implant help make me look younger? Chin augmentation can be an important component of a comprehensive facial rejuvenation plan. Depletion of facial fat and changes in bone structure can exacerbate visible signs of aging especially around the cheeks, chin, mouth, and jawline. When combined with a facelift, neck lift, and/or cheek lift, a chin implant can help accomplish wrinkle reduction and restoration of volume and structure in the lower third of the face. During a facial rejuvenation consultation with Dr. Matas, he can suggest the procedure or combination of procedures that are best suited for creating a more youthful appearance. For the first time in your life, you will have a more balanced face and the renewed self-confidence that goes with it when you see yourself in the mirror. And, unlike some cosmetic surgery, the results from your chin augmentation are permanent and long-lasting.